The M Squared Builders & Designers’ 2019 Spring Green Home Tour entry. DURHAM, N.C. – April 2, 2019 – PRLog — Michele Myers, President/General Contractor of M Squared Builders & Designers, is proud to announce the company’s 2019 Spring Green Home Tour entry located at 1829 Whippoorwill Lane in Chapel Hill. 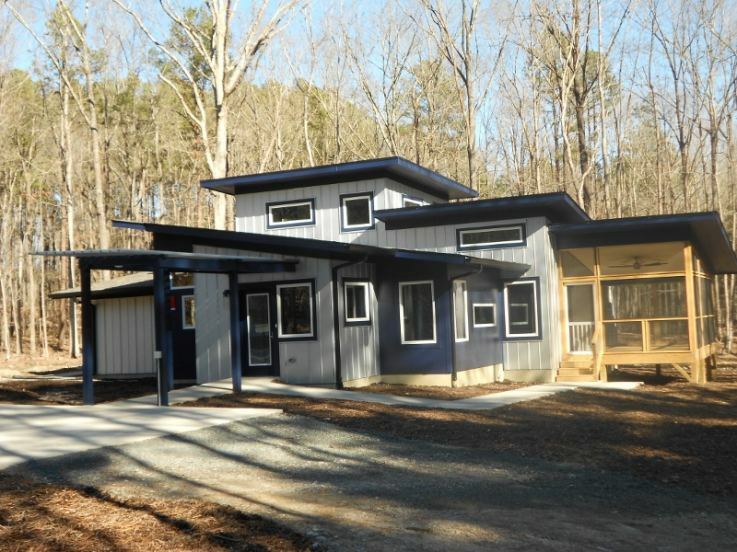 The Spring Green Home Tour is a self-guided tour of select high performing homes throughout the Triangle, taking place from noon to 5 PM on April 27 – 28 and May 4 – 5. In its 14th year, the Spring Green Home Tour is sponsored by the High Performance Building Council of the Home Builders Associations of Durham, Orange, and Chatham Counties and of Raleigh-Wake County. The primary living space of the home is one level with multiple zero-step entries into the interior. Standard universal design features were incorporated, including rocker switches, lever handles, higher placement of outlets, built-in pedestals for the laundry and dishwasher, and a no-barrier walk-in shower. All doors are wide enough to accommodate a wheelchair, with extra space for turning around in closets, pantry, and bath areas. The floor materials were selected to be suitable for wheelchairs, and additional blocking was installed in the bathroom walls so that grab bars could easily be added in the future. As Krautheim mentioned, numerous healthy green features were included in his home. These include R-3 ZIP sheathing for improved energy efficiency; metal siding with recycled content, which requires little to no maintenance; and the use of LED fixtures and Low-E windows, allowing for considerable natural light. A hybrid insulation strategy was utilized to capitalize on cost and energy savings; a Carrier 17 SEER heat pump was installed for increased comfort by controlling both temperature and humidity; and WaterSense plumbing fixtures were incorporated for water conservation. Fresh air ventilation and non-toxic finishes allow for improved indoor air quality; wiring for future active solar and electric car charging was installed; and the Universal Design features previously named were utilized throughout. The features above name only a few of the healthy green practices employed by M Squared Builders & Designers. Myers, who holds the Master Certified Green Professional (MCGP) designation and Rachel Bath, Executive Vice President/Chief Financial Officer/Real Estate Broker, will be available to answer questions at this home during the Tour weekends. Myers is the Founding Chair of the High Performance Building Council of the Triangle, formerly known as Green Home Builders of the Triangle. The Spring Green Home Tour has taken place annually since 2005, with participation by M Squared Builders & Designers each year. ABOUT M SQUARED BUILDERS & DESIGNERS: M Squared Builders & Designers is an award-winning company dedicated to creating healthy green living environments for new homebuyers and existing homeowners in ways that enhance individual health with the least impact to our natural environment. The company offers services in new home construction, major remodeling and kitchen renovations. For more information on Myers and M Squared Builders & Designers, visit www.msquaredbuilders.com or call 919-620-8535.